Surveillance colonoscopy should be offered at appropriate intervals as there is a significant increase in the risk of colorectal cancer 10 years after onset of IBD. Crohn’s disease can affect any part of the gastrointestinal tract, and may cause diarrhoea, abdominal pain, weight loss, and perianal problems. A diagnosis of IBD is usually confirmed by a gastroenterologist and the patient should, ideally, receive long-term follow up in a specialised IBD clinic. GPs are, however, becoming increasingly involved in the shared care of patients with IBD, and need to be familiar with the pertinent guidance. The results of the third round of the UK IBD audit in 2012 included a questionnaire for GPs caring for patients with IBD who had recently been admitted to hospital.15 A summary of the key findings is shown in Box 1. The report revealed that GPs often experienced difficulties in obtaining specialist advice regarding their IBD patients. In this respect, a lack of awareness regarding the existence and role of the IBD clinical nurse specialist (IBD-CNS) was also highlighted. Currently, more than 70% of hospitals in the UK have an IBD-CNS,16 and GPs are encouraged to seek their advice in the management of patients with IBD. The role of the IBD-CNS has evolved and they are now an integral part of the IBD multidisciplinary team; in particular, they provide a telephone advice line service for GPs and patients. The IBD-CNS can offer immediate advice on investigations, treatment, and monitoring of patients in the community, and can escalate care if required. In a UK survey of young people (aged ≤29 years) with IBD, 76% reported having access to an IBD-CNS,17 and the majority reported that this was their preferred primary point of contact. GPs perceived that they needed more education about IBD, particularly regarding colon cancer surveillance requirements. Faecal calprotectin is an inflammatory marker protein released by neutrophils in the gut and can act as a surrogate marker for intestinal inflammation. NICE recommends faecal calprotectin testing as an option to help differentiate between IBD and other non-inflammatory conditions (such as irritable bowel syndrome) in adult patients with intestinal symptoms, in whom cancer is not suspected.18–21 Quantitative testing is preferable and should arguably be confined to patients aged less than 40 years and whose symptoms are indicative of IBD.22,23 A cut-off threshold of 50 μg/g in appropriate patients gives a sensitivity of over 90%, but a specificity of about 75%. The faecal calprotectin test is particularly useful for triaging both children and young adults with suspected IBD for early specialist assessment. Faecal calprotectin testing may also be useful in distinguishing functional symptoms from disease activity in patients with established IBD, although its role in the monitoring of disease activity has yet to be fully elucidated. When travelling abroad, people who are not receiving immunomodulators should follow standard vaccination guidelines in accordance with the destination. Immunisation with live vaccines including polio, rubella, and yellow fever are contraindicated in individuals who are receiving corticosteroids, immunomodulators, or biologic agents and for 3–6 months after cessation of treatment; 8,9 alternatives to live vaccines may be considered for patients under these circumstances. It should be noted that a letter of medical exemption from yellow fever vaccination may be required to visit certain countries, but may not be universally accepted. * This list is additional to standard vaccinations recommended for the general population. A detailed overview of guidance on the therapeutic management of IBD has been covered in previous Guidelines in Practicearticles.26,27 The 3rd round of the UK IBD Audit 2012 indicated that treatment was not initiated in one-third of patients who consulted their GP in the month prior to their admission (see Box 1).15 There was also marked variability in prescribing medications by GPs when confronted with a patient with IBD having a flare. As such, we have a provided a few key pointers for GPs to consider in this circumstance. When considering initiating therapy in UC flare, both disease location and severity need to be addressed. 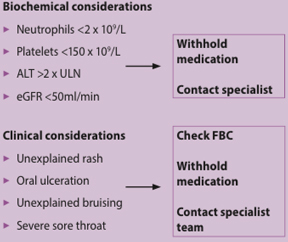 Severity can be assessed using the Truelove and Witts’ criteria, which stratifies a flare from mild to severe.28 A severe flare is defined as six or more bloody stools with one or more of the following systemic features: temperature >37.8 °C, pulse >90 beats per minute, anaemia, or erythrocyte sedimentation rate (ESR) >30mm/hour. * Although the NICE guidance is specific to azathioprine, it is not unreasonable to consider it transferable to 6-mercaptopurine. Anaemia commonly occurs in IBD. Although usually multifactorial, the most frequent causes are iron deficiency anaemia (IDA) and anaemia of chronic disease. The severity of anaemia is often proportional to disease activity. The ECCO guideline advocates 6–12 monthly monitoring of haemoglobin (Hb) levels in stable or mild disease10,29 and more frequent monitoring in active disease. Confirmed IDA should always be treated. This requires appropriate control of the underlying disease activity, coupled with iron replacement therapy. This can be in the form of oral iron supplementation: a small dose of ferrous sulphate 200 mg, once or twice daily (or any other oral iron preparation) is recommended as gastrointestinal side-effects are dose related and higher doses are not absorbed. Alternatively, parenteral iron preparations, which are administered in hospital, may be used if oral preparations are not tolerated or poorly absorbed. Parenteral iron is indicated in the presence of severe anaemia (Hb <10 g/L). In patients with small bowel Crohn’s disease and/ or extensive small bowel resections, yearly vitamin B12 and folate levels are recommended. Deficiencies of folate and B12 can be managed with oral and intramuscular preparations respectively. Osteoporosis affects up to 3 million people in the UK,34 and patients with CD and UC have a moderately increased risk of hip fracture (relative risk of 1.68 and 1.41, respectively).35 This may be caused by a number of factors including exposure to corticosteroids, poor nutrition, malabsorption, and a low body mass index. Diagnosis of IBD at an earlier age and a history of small intestinal resection confer additional risk.11 in patients with IBD may be overlooked as general guidance primarily focuses on an older population, and blanket dual energy X-ray absorptiometry (DEXA) scanning in patients with IBD is not currently recommended. Certain individuals with significant risk factors, however, may qualify for DEXA. The World Health Organization Fracture Risk Assessment tool (FRAX®) is widely used to calculate fracture risk, but is only applicable to patients above the age of 40 years and has not been validated for an IBD population. In the absence of a risk-scoring system specific to patients with IBD, the authors suggest a holistic approach that takes into account other risk factors for osteoporosis. The BSG guidance on investigation, management, and treatment of osteoporosis in the IBD population is summarised in Box 4.11 No specific guidelines exist for younger patients without risk factors, but a DEXA scan every 5 years would seem reasonable. consider bisphosphonate therapy if T score < -1.5, or repeat DEXA yearly until treatment threshold has been reached. Steroids should be used cautiously—choose budesonide over prednisolone for small bowel or caecal Crohn’s disease. Patients who are intolerant to oral bisphosphonates should be treated with ibandronic acid (3-monthly injections), raloxifene (for postmenopausal women), subcutaneous teriparatide for 18 months, or intranasal calcitonin. Adapted from British Society of Gastroenterology. Guidelines for osteoporosis in inflammatory bowel disease and coeliac disease. BSG, 2007. Patients with UC and CD have an increased risk of colorectal cancer (CRC), the risk rising significantly after 10 years from disease onset. Surveillance colonoscopy should, therefore, be offered 10 years after diagnosis. Intervals for subsequent surveillance colonoscopy (yearly, 3-yearly, or 5-yearly) depend on disease extent, the presence of inflammatory polyps, strictures, and family history of colorectal cancer.12People with primary sclerosing cholangitis, an associated condition, have a much higher risk of CRC and require yearly colonoscopy. Surveillance is primarily directed by secondary care, but it is important for GPs to know the requirements to ensure that patients who may have ceased follow up in hospital clinics are offered colonoscopy at the appropriate time. Knowledge and appropriate implementation of current guidelines, local pathways, and shared-care protocols, coupled with effective communication between primary and secondary care are essential for the optimal care of patients with IBD. Where available, the IBD-CNS has become a critical point of contact for the GP. Good communication supports optimal management and avoidance of hospital admissions. Although individual GPs will have few patients with IBD under their care, knowledge of contemporary guidelines relevant to primary care is essential for best practice. Kalla R, Ventham N, Satsangi J, Arnott I. Crohn’s disease. BMJ 2014; 19 (349): g6670. doi: 10.1136/bmj.g6670. Mowat C, Cole A, Windsor A et al. Guidelines for the management of inflammatory bowel disease in adults. Gut 2011; 60 (5): 571–607. Lakatos P, Lakatos L, Kiss L et al. Treatment of extraintestinal manifestations in inflammatory bowel disease. Digestion 2012;86 (Suppl 1): 28–35. doi: 10.1159/000341950. Frolkis A, Dykeman J, Negrón M et al. Risk of surgery for inflammatory bowel diseases has decreased over time: a systematic review and meta-analysis of population-based studies.Gastroenterology 2013; 145 (5): 996–1006. Chatu S, Subramanian V, Saxena S et al. The role of thiopurines in reducing the need for surgical resection in Crohn’s disease: a systematic review and meta-analysis. Am J Gastroenterol 2014; 109 (1): 23–34. Chatu S, Saxena S, Subramanian V et al. The impact of timing and duration of thiopurine treatment on first intestinal resection in Crohn’s disease: national UK populationbased study 1989–2010. Am J Gastroenterol 2014; 109 (3): 409–416. Chhaya V, Saxena S, Cecil E et al. The impact of timing and duration of thiopurine treatment on colectomy in ulcerative colitis: a national population-based study of incident cases between 1989–2009. Aliment Pharmacol Ther 2014; doi:10.1111/apt.13017. Rahier J, Magro F, Abreu C et al. Second European evidence-based consensus on the prevention, diagnosis and management of opportunistic infections in inflammatory bowel disease. J Crohns Colitis 2014; 8 (6): 443–468. Van Assche G, Dignass A, Bokemeyer B et al. Second European evidence-based consensus on the diagnosis and management of ulcerative colitis Part 3: Special situations. J Crohns Colitis 2013; 7 (1): 1–33. Cairns S, Scholefield J, Steele R et al. Guidelines for colorectal cancer screening and surveillance in moderate and high risk groups (update from 2002). Gut 2010; 59 (5): 666–689. Alexakis C, Davies G, Stephens J et al. Perspectives and attitudes of young patients with inflammatory bowel disease: symptoms, burden of disease and communication with their healthcare professionals.Frontline Gastroenterol 2013. doi:10.1136/ flgastro-2013-100400. NICE website. NICE pathways. Crohn’s disease overview. pathways.nice.org.uk/pathways/ crohns-disease (accessed 2 December 2014). NICE website. NICE pathways. Ulcerative colitis overview. pathways.nice.org.uk/ pathways/ulcerative-colitis (accessed 2 December 2014). Poullis. Wandsworth Clinical Commissioning Group draft guidelines on using faecal calprotectin in primary care. Personal correspondence, 2014. NICE website. Faecal calprotectin diagnostic tests for inflammatory diseases of the bowel. DG11 Faecal calprotectin diagnostic tests for inflammatory diseases of the bowel: costing template. Available at: www.nice. org.uk/guidance/dg11/resources (accessed 2 December 2014). Toruner M, Loftus E, Harmsen W et al. Risk factors for opportunistic infections in patients with inflammatory bowel disease.Gastroenterology 2008; 134 (4): 929–936. Jen M-H, Saxena S, Bottle A et al. Increased health burden associated with Clostridium difficile diarrhoea in patients with inflammatory bowel disease. Aliment Pharmacol Ther 2011; 33 (12): 1322–1331. Truelove S, Witts L. Cortisone in ulcerative colitis; final report on a therapeutic trial.Br Med J 1955; 2 (4947): 1041e8. Dignass A, Van Assche G, Lindsay J et al, for the European Crohn’s and Colitis Organisation (ECCO). The second European evidence-based consensus on the diagnosis and management of Crohn’s disease: Current management. J Crohns Colitis 2010; 4 (1): 28–62. Feagan B, Chande N, MacDonald J. Are there any differences in the efficacy and safety of different formulations of oral 5-ASA used for induction and maintenance of remission in ulcerative colitis? evidence from Cochrane reviews. Inflamm Bowel Dis 2013; 19 (9): 2031–2040. Gordon M, Taylor K, Akobeng A et al. Azathioprine and 6-mercaptopurine for maintenance of surgically-induced remission in Crohn’s disease. Cochrane Database Syst Rev2014; 8: CD010233. Colombel J, Ferrari N, Debuysere H et al. Genotypic analysis of thiopurine S-methyltransferase in patients with Crohn’s disease and severe myelosuppression during azathioprine therapy. Gastroenterology 2000;118 (6): 1025–1030. NICE website. Clinical Knowledge Summaries. DMARDS. Scenario: Azathioprine. Azathioprine monitoring requirements. January 2013. cks.nice.org.uk/ dmards#!scenario:1 (accessed 4 December 2014). National Osteoporosis Society website. Key messages. Available at: www.nos.org.uk/page. aspx?%20 (accessed 4 December 2014). Card T, West J, Hubbard R et al. Hip fractures in patients with inflammatory bowel disease and their relationship to corticosteroid use: a population based cohort study. Gut 2004;53 (2): 251–255.